Hi guys! Hope you’re having a happy Tuesday. 🙂 So far, so good around here! Amelia and I did something new today, and I just have to share! As Amelia is getting older she’s starting to get pretty bored with staying at home, and to be honest I don’t blame her, I get bored here too!! Want an example of just how bored she gets? She likes to follow me everywhere I go when we’re at home, and this morning she was in the bathroom with me while I was brushing my teeth and getting ready. 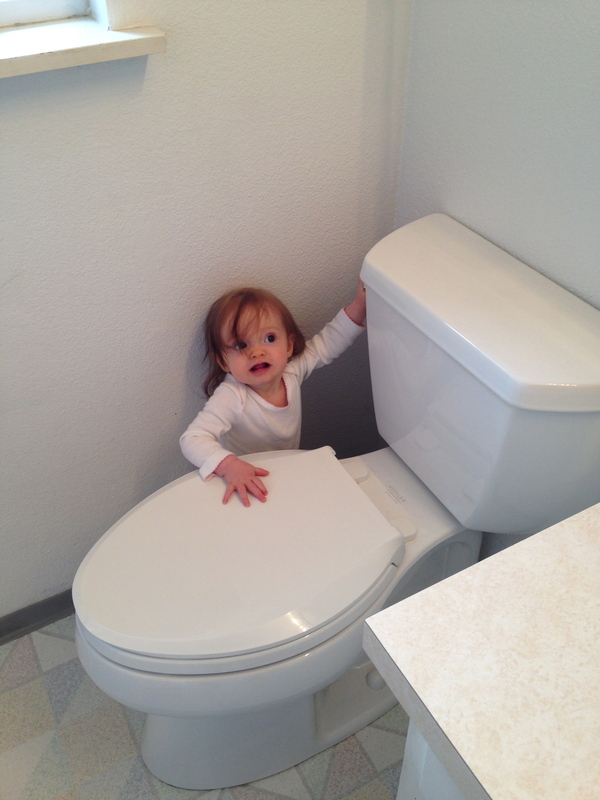 I look over and there she is, standing next to the toilet, figuring out that she can flush it on her own! Then, as she pushes the handle down to flush the toilet, I turn around to go get her, and she quickly stuffs a wad of toilet paper in her mouth! Oy. The new game this week is seeing how much of the toilet paper roll she can unravel before I can stop her. Hahaha She’s pretty funny sometimes!! Anyways, this is why I need to get both of out of the house so we an burn off some of this extra energy and have a little fun! Amelia loves playing with other kids and most of my girlfriends either have kids or are nanny’s, so we try to go on play dates on a pretty regular basis (when she’s not sick of course). 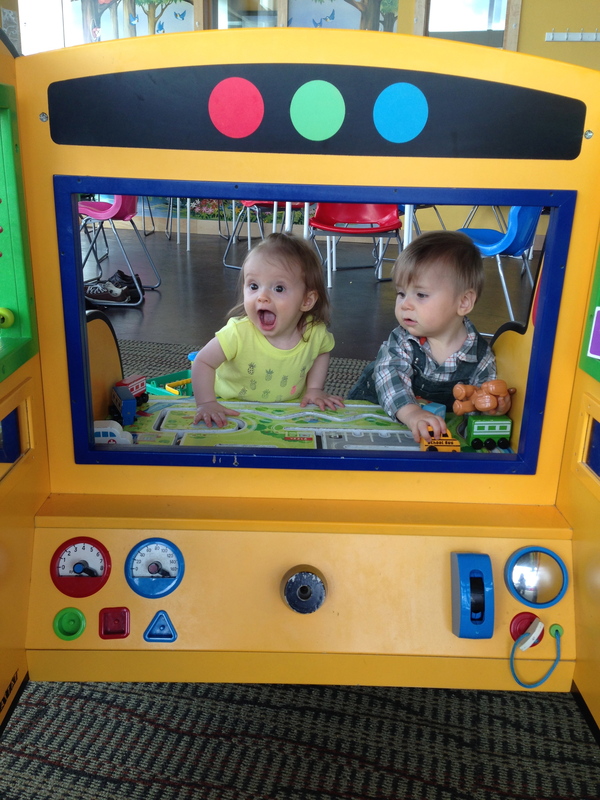 For those of you that have kids, you know that these play dates are an important component to a mom’s sanity! 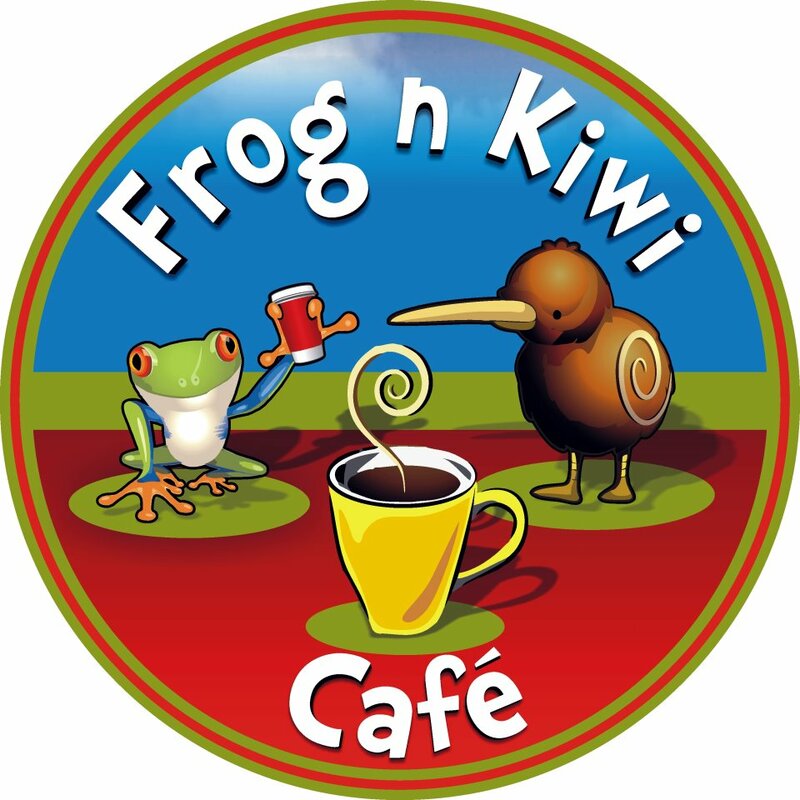 So today, we went and met up with some of my girlfriends and their little’s at this place called Frog N’ Kiwi Cafe (they don’t have a website, but just click on the link and check out their Facebook page). We had only been there once before when Amelia was about 4 months old, and at that point she was just laying around not doing much. Since she’s finally over her cold(s), I figured now was as good a time as ever to arrange a play date with all of my friends and their kids! 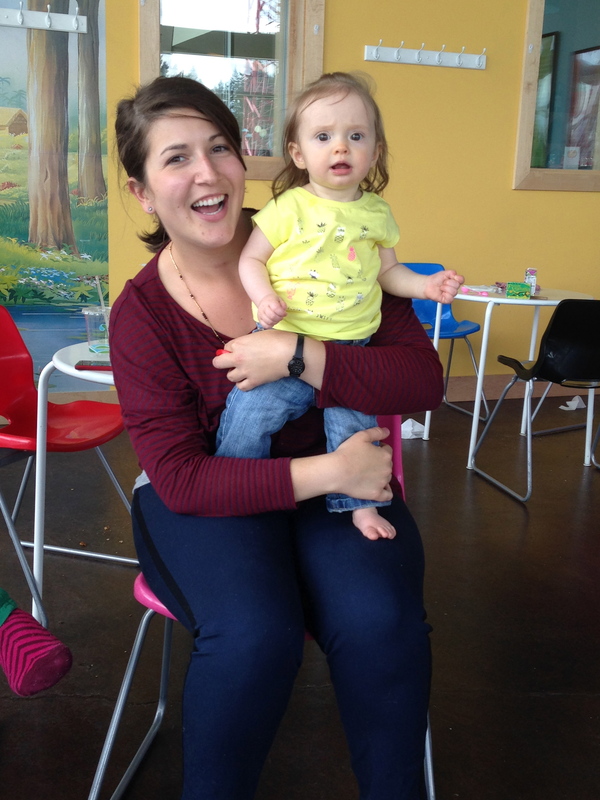 Frog N’ Kiwi is awesome guys, and Amelia had so much fun! 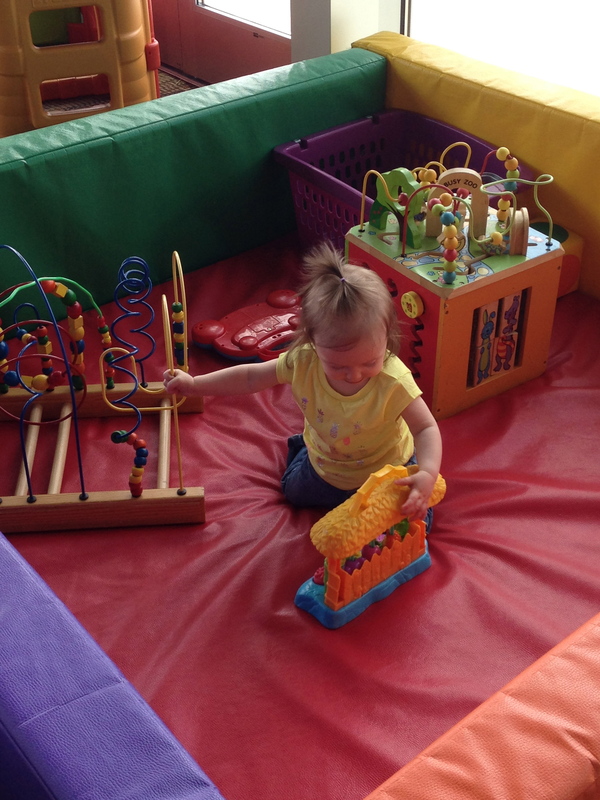 It has a cafe so that you can get coffee, tea, pastries, etc and and attached play area. It’s locked and you can’t get a code unless you pay to go in, or buy something, so it’s safe for the kids. For those of you who know us, you know that Amelia definitely has a case of the “mommy’s”, and it’s rare that she detaches herself from me when we go somewhere. 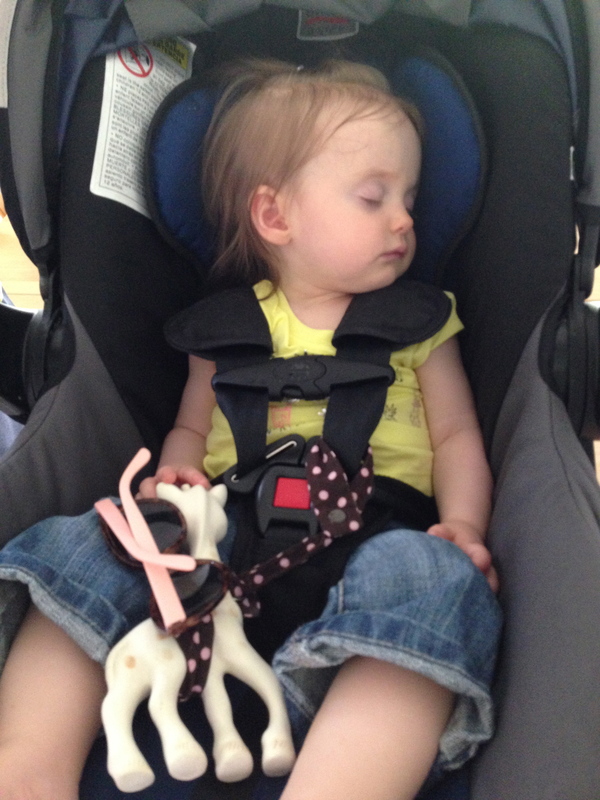 The minute we got there, I sat her down and she was off and running…well, more like crawling but you get the point! I was so proud of my little girl, who is growing up so fast. She saw other kids playing and went over to where they were and just watched and absorbed all that was going on. 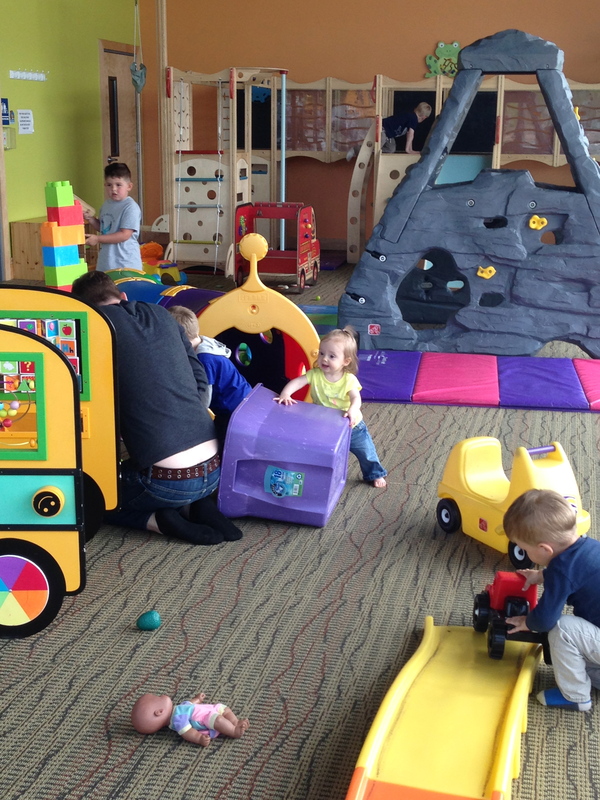 That’s Amelia in the yellow shirt, just hanging out and playing independently! One of my friends that came has a son (Levi) that’s a day younger than Amelia, and it was really fun to watch them play! For the most part she just did her own thing and ate whatever toys looked delicious at the time (you know….cause she’s a baby, and that’s what they do). But, occasionally she played with Levi or came over to me for a quick cuddle or a snack before she went back to playing! Oh Heyyyyyyyy! Amelia and her little friend Levi! The kids played hard for two and a half hours before we all decided it was time to go. It really was a great day, and I’m so happy that I got a chance to spend time with my friends, and watch Amelia play and thrive in her own little environment. Now she’s fast asleep, and for another 30 minutes or so I get to sit and enjoy the quiet time, and reflect on what a great day this has been. It’s these moments, and these days that remind me how lucky I truly am. I’m surrounded by wonderful women who make up a great support system and love me and my daughter very much. We’re blessed enough to have opportunities to go do fun things like we did today. Amelia gets to learn more about the world around her, and I get to watch my little baby grow into a little girl. I could tell that Amelia was happy today because she crawled over to me, gave me a huge hug and a huge wet kiss. Some days, that’s all I need to make me feel happy and whole. Hope you all have had a good of a day as I have!